Okay. This article has been in the drafts section on the FPI site for a very long time and for some reason I can't get it to quite pull together in the way I want, so I'm posting it on here, cos no-one reads this, and also, I have no standards to try and meet- I do hate to drag Joe and Richard's hard work down. Earlier this year, on reading the praise for the newly relaunched Turtles comics and the release of the Ultimate Teenage Mutant Ninja Turtles collecting the first half of Kevin Eastman's and Peter Lairds' original black and white run, I realised I'd never actually read a turtles comics. The Turtles have become one of those cultural phenomenons, with a lot of their mythos seeping over into the everyday, without people realising where it came from. Then there are others, like me, who have watched the movie or cartoons, aware that they're derivative of the comics, but have never read any of the books. Instead of shelling out on the ultimate edition, a scouring of ebay and Amazon led me to the Steve Lavigne coloured editions that Penguin published in the 90's. Armed with the first four books, I was ready to immerse myself in shell lore and perhaps emerge with a new obsession. Needless to say, things didn't go quite to plan. I loved the first volume, but the adventures into space in the second and the Cerebus tie-in(!) in the third weren't my cup o' crazy. The fourth book was my favourite: the story building, building, as it cuts between Leonardo fighting at first a lone ninja, then a couple, until eventually he is besieged and overcome, Eastman's frenetic art showcased beautifully in the snowy fighting scenes. Oblivious to his trials, the rest are merrily decorating the house for Christmas, a idyll that is literally shattered as Leonardo is smashed through the window of their home. From there, the Turtles only option is to escape, which they barely manage to do. The book's second half has a slower, introspective pace as the reeling Turtles retreat from the returning Shredder's assault to regain their strength and face their insecurities, topped with Eastman's ponderous woodland scenes; it's simply a great comic. 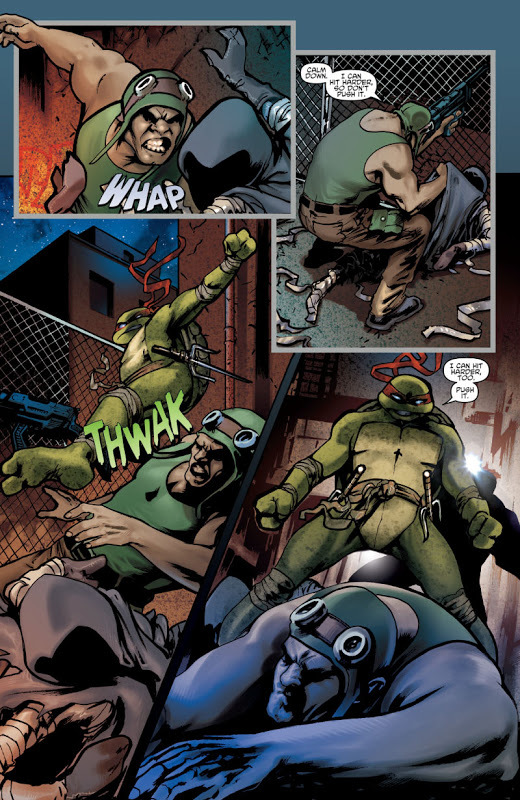 All this is to say, I love the concept of the Turtles: mutated human-sized turtles trained as ninjas- it's a no-brainer. But I was slightly put off by those messy second and third books and unsure whether to continue reading further. Much has been made of Eastman's involvement in the 're-boot'of the series and it's good, but I don't want to make a judgement of it until I've read where the involvement of inter-galactic visitors goes, something it was approaching at the end of Enemies Old, Enemies new. The space element is the derailing point for me, so I'm interested to see how they deal with it. In the meantime, IDW released a new micro-series and unable to resist, I bought a copy. And wow. At last! A TMNT book i can love and recommend unreservedly. The microseries works brilliantly giving us four stories featuring in turn, Donatello, Rafael, Michelangelo and Leonardo. Written by Brian Lynch, the stories highlight the turtle's distinct personalities, which when in a group are often reduced to certain catch phrases or fighting styles. It may seem like an obvious ploy to give each of turtles a singular platform, but that's what its designed to do and it works very well. What it does exceptionally well, is show how the each turtle functions within the family and group, realising his place and as individuals how they view as needing something different from the collective. 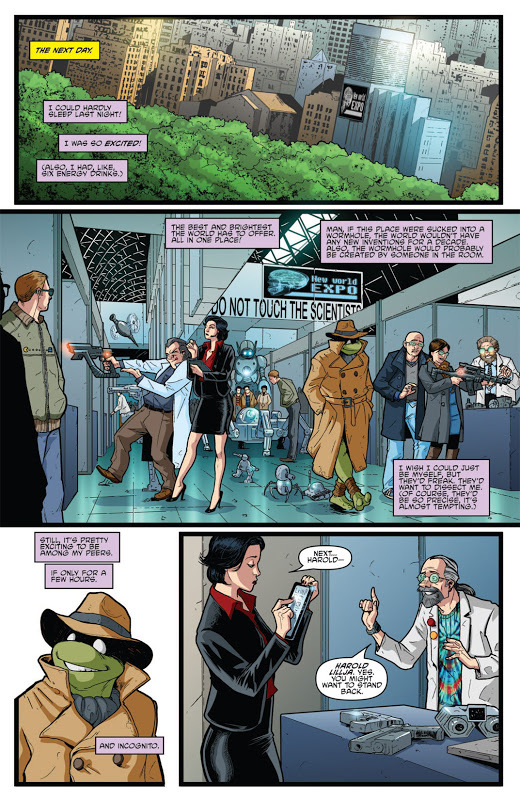 Additionally, they all slot into the continuity of the rejuvenated TMNT series, referencing happenings directly, though it's till understandable to the novice reader (like me). 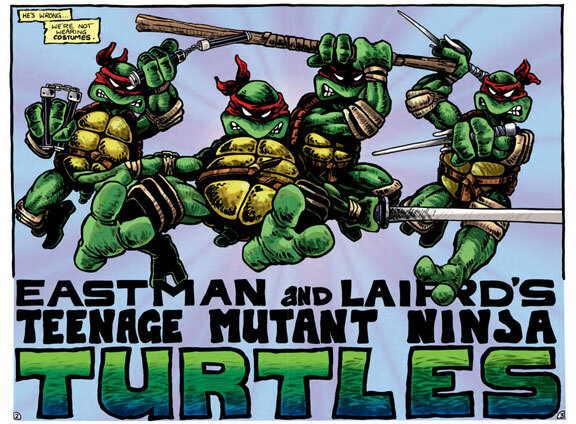 When TMNT was relaunched, it was re-launched with 3 turtles. Raphael was missing and unaware of the existence of his brothers who were searching for him. He was still fulfilling his hero credentials however, fighting crime with his human friend Casey Jones. This story of a night time patrol with Casey resulting in the discovery of another mutated animal who claims to have been at the same lab as the Turtles, focuses on Raphael adjusting to his new-found family whilst highlighting his bond with Casey. It also showcases his strength and physicality, as he works through his thoughts and problems with his fists rather than words. How great is that cover by Andy Kuhn? I love it's mixture of homages to Bass and noir. Michelangelo is a bit of a day-dreamer- thinking isn't really his strong suit. So it's no surprise to see him going incognito in a cinema on New Year's Eve, watching some romantic tosh of a movie and eating popcorn and wondering why his life isn't more like celluloid (Mike, if only you knew). His impulsiveness leads him to crash a costume party he chances upon when making his exit: the perfect opportunity to inject his life with some of the fun he feels it's lacking. Unfortunately his spontaneous decision leads to a case of mistaken identity, as he finds himself smack in the middle of the kind of action he partakes in with his brothers on a regular basis, and with shrewd tactics and analysis not his field, he has to somehow eke a way out of trouble. Donnatello's short is the highlight of this book, perhaps because he arguably the most interesting turtle of the bunch, as his passion and interest in science serves to really set him apart and define his personality a little more. A bit introvertive, with a love of computers and video games, he is basically geek-turtle. He appreciates his brother's attempts to indulge and try to share in his hobbies , but they're easily bored and The lure of a science expo with the best and brightest minds showcasing the latest technology and inventions results in a bizarre, rather bonkers series of events culminating in the facing of a familiar and all-too serious enemy. Brian Lynch really excels here, delivering a pithy and humorous story that serves Donnatello's particular traits well, whilst fitting into the larger narrative at play in the Turtle series. 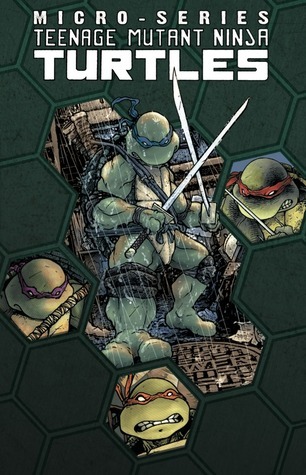 There's a new element (as far as I can tell from the 'old' TMNT books) in the re-launch, that of reincarnation: that the turtles were four Japanese brothers raised by their father in ways of the ninja after the murder of first their mother and then the boys and their father. This is obviously mirrored in the turtles' relationship with Splinter. 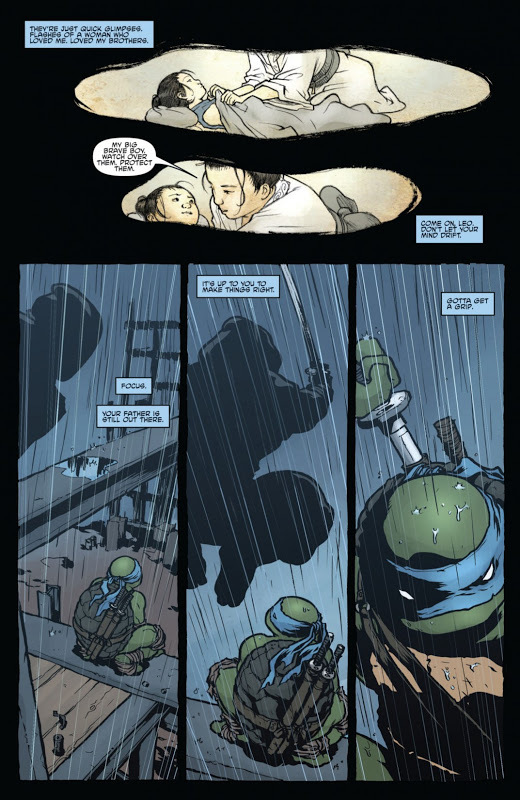 Leonardo's story here is more thoughtful and reflective and reminiscent of the original fourth Turtles book in his taking on of multiple assailants, albeit without the atmosphere of that book. 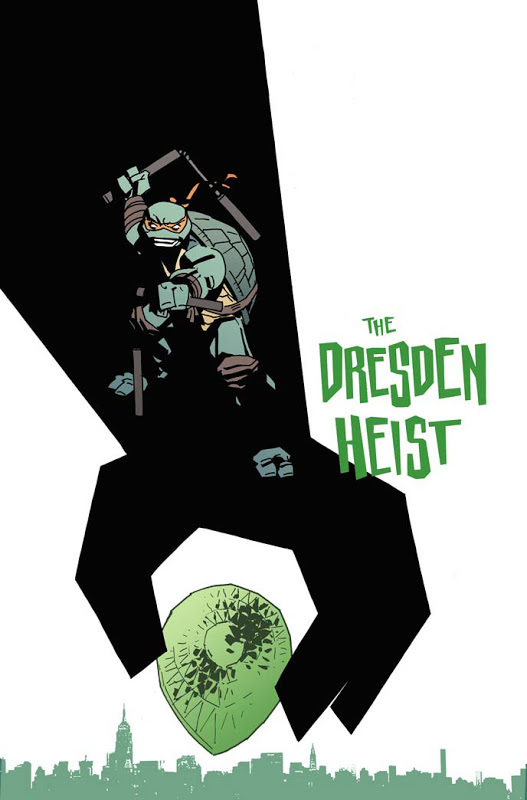 I really enjoyed this book: it was the first time I felt the Turtles really came together for me and that was partly due to this being the first time I've seen them depicted as distinct personalities, which is obviously what the whole function of the mini-series is, so it fulfils its remit very, very, well. On a final note, not only was the book great fun, the artwork is brilliant- particularly David Peterson's covers and Ross Campbell's sinewy, leather renderings. Read it if you can.